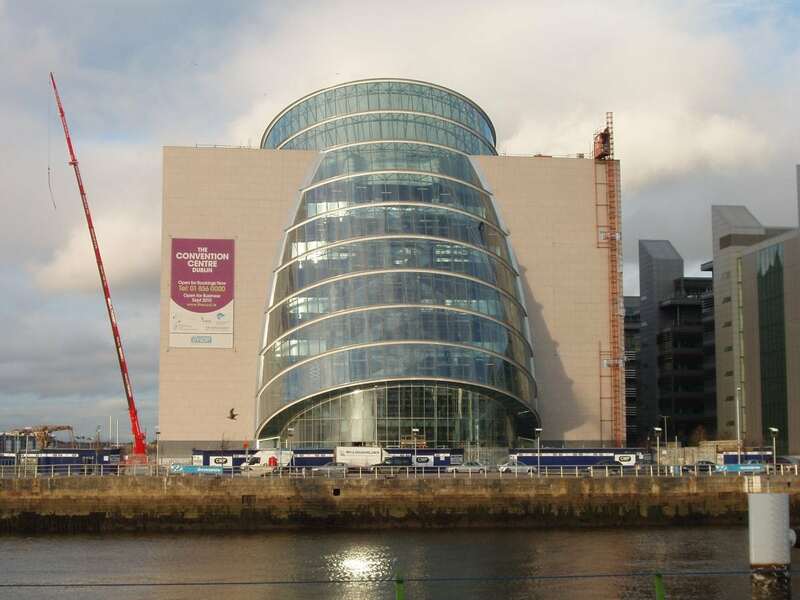 The Convention Centre Dublin is the world’s first Carbon neutral convention centre. The landmark building meets the highest standard of environmental sustainability. By incorporating Ecocem into the concrete, over 10,500 tonnes of CO2 were saved during the buildings construction. It is a centre for both national and international exhibitions and conferences with a capacity for over 8,000 people. The building is characterized by its impressive glass frontage that overlooks the River Liffey and houses a 2,000 seat auditorium, 2,000 seat banquet/exhibition hall, another 3,000 seat exhibition hall and various meeting rooms and back of house facilities. The Convention Centre construction was a joint venture between Treasury Holdings Limited and John Sisk and Sons. These two companies engaged in a Construction Management Partnership as both the design and build contractors. Works on the centre officially began in 1998 but it wasn’t completed until 2010. 13,000 tonnes of structural steel and 35,000m3 of concrete was used in the construction of this building. GGBS was specified for both the deep foundations and the basement of the centre with 70% GGBS being specified in both areas. A high percentage of GGBS was used to reduce permeability, increase durability and to reduce the likelihood of thermal cracking. The Convention Centre is the world first carbon neutral convention venue. This was achieved by using cutting edge mechanical systems, inclusion of GGBS in construction and the usage of off-site renewable energy to power the building. One of the most important aspects to the construction of the Convention Centre is its 100 year design life with major replaceable features such as cladding which would have a 40 year life.